La Grange City Hall is located at 307 W. Jefferson Street, La Grange, KY 40031; phone: 502-222-1433. Photo: Ashbourne Farms, ca. 1937, 3800 Old Westport Road, La Grange, KY. Listed on the National Register of Historic Places in 2008. Photographed by User:Jordan Wages (own work), 2012, [cc-by-3.0 (creativecommons.org/licenses/by/3.0)], via Wikimedia Commons, accessed November, 2015. In January 1827, the Kentucky General Assembly passed an Act authorizing the citizens of Oldham County to vote to select their seat of justice, providing that not more than two places be put in nomination and that one of them be Westport, the river town on the Ohio River that was at the time serving as the county seat. 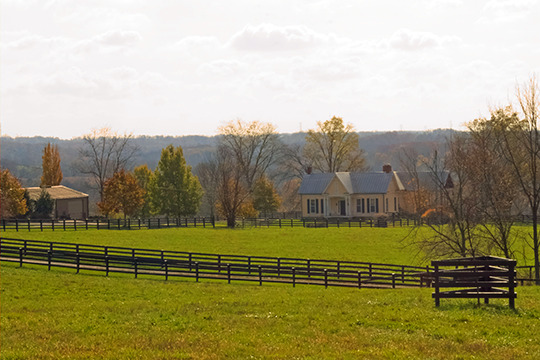 William Berry Taylor, owner of much land in Oldham County, submitted a proposal to the county court offering a fifty-acre tract of land at the crossroads of the Westport-Shelbyville and Louisville-New Castle roads, two of the county's most important routes, for the purpose of creating a new county seat. Although well situated on high ground with a spring, the property was selected by only one vote. In May, 1827, Taylor conveyed the fifty acres to the newly appointed trustees of the town. He decreed that the town should be named La Grange in honor of General La Fayette, who had visited in the vicinity during his 1824 trip around the United States and whose home in France was called "La Grange." Taylor stipulated that the trustees select the ground necessary for a courthouse, a courtyard, a jail, and a stray pen, a half acre lot for a church, an additional half acre for a burial ground, and a half acre lot for a schoolhouse and spring lot. A parcel equal in size to the above was to be reserved for him. The remaining land was to be divided into lots and sold. William T. Barbour, son-in-law of William Berry Taylor, was selected to survey the land and lay off the town into streets and lots. On July 24, 1827 he submitted his plot to the trustees, and on July 30, 1827 the first 56 of the 96 town lots were sold at public auction to a large group of people, many of whom later settled in the town. La Grange was laid out in a sixteen-block gridiron format with the courthouse square located prominently near the center of town. The county courts moved to a temporary building constructed on the La Grange courthouse square for their July, 1827 session and immediately ordered that a permanent courthouse be built. However, before the one-story wood-framed, gable-roofed courthouse was completed in September, 1828, an Act of the General Assembly generated by political pressure returned the seat of justice to Westport. Not until 1838 did a second citizen's vote return the county seat permanently to La Grange. Almost no development occurred in La Grange before 1838. The population of the town in 1830 was only 27. Very little is known of who lived in La Grange then. One altered, double-pen log house at 207 North Walnut Street, outside the district, could date to this early period. Otherwise, no structures from this time remain. According to John T. Ballard, an early resident, almost nothing but the empty courthouse was there in the 1830s. The 1838 return of the county courts to La Grange clearly was the catalyst for the first development. The town was incorporated in 1840, by which time the population had reached 233. According to Ballard, La Grange was bursting with residential and commercial building activity in the early 1840s. The Baptists, the earliest religious group established in La Grange, built a church about 1838 or 1839; the first Methodist Episcopal Church was constructed in 1842; the first Christian Church dated from about 1845. Funk Seminary, the town's prestigious school that evolved into Masonic College, was established in 1842. All these institutions were houses in substantial brick structures. In 1846, Lewis Collins in his Historical Sketches of Kentucky reported the presence of six lawyers, three physicians, five stores, and twelve to fifteen mechanic's shops. One wooden hotel is also known to have existed. But it was the 1851 arrival of the railroad that really cemented the town's future. In 1830 the Lexington and Ohio Railroad Company was set up to build a railroad between Lexington and some point on the Ohio River, but by 1834 construction had stopped and only the portion between Lexington and Frankfort had been completed. In 1847 the newly established Louisville and Frankfort Railroad Company bought out the interests of the old company and began construction at both terminuses on a new line to connect Louisville and Frankfort. The track was completed in 1851 and was routed then, as it is today, straight down La Grange's Main Street. With the arrival of the railroad came the immediate expansion of the original town so that La Grange, for the first time, was able to compete with Westport as a commercial and shipping center. Even before the tracks were laid in 1851, two parcels of land—Taylor's Enlargement and Barbour's Enlargement—were subdivided and platted along the railroad right-of-way to the east of town. In 1854, the town's boundary was officially enlarged. Carolyn Brooks, Historic Preservation Consultant, Central La Grange Historic District, Oldham County, Kentucky, nomination document, 1988, National Park Service, National Register of Historic Places, Washington, D.C.